We build scalable and secure knowledge management systems so that organizations can share, track, and archive documents, while meeting compliance standards. Alfresco is being used in governments at all levels (national, regional, municipal), as well as in a wide variety of institutions (universities, hospitals) and businesses (banking, insurance, manufacturing, IT, etc.). The Alfresco platform is designed to be customized and tailored. It is modular and easy to build on, which enables the creation of custom and branded portals adapted to your reality. Alfresco is built on an open-source core with open APIs and open standard support for easy integration, extension and long-term flexibility. Leading applications that work with Alfresco include: Salesforce, Outlook, Google Docs, Google Drive, Office, SAP, AudoDesk, Box, and more. Why work with SOLJIT for Alfresco? 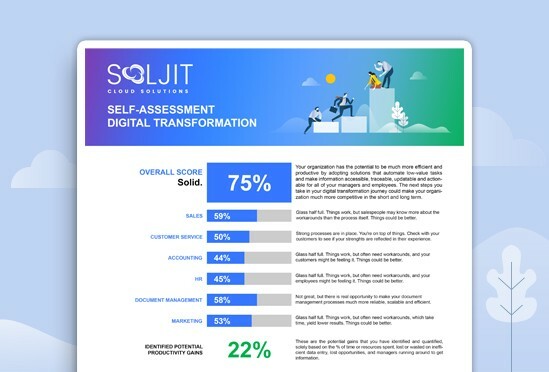 By far, the best reason to work with SOLJIT is that we want your organization to be successful now and in the long term. SOLJIT is a System Integrator Authorized Alfresco Partner with experience in both institutional and corporate clients, including government, education, healthcare, finance and a wide variety of business sectors. You can find us here in their partner directory. Our team boasts Alfresco certified business analysts and developers, to ensure that you get the most out of your solution, from project kick-off, to implementation, to handoff. Although most of our projects are full implementations, our Alfresco service packages are flexible and include time blocks, which can be used for support or for the continuous improvement of your systems. Quickstart packages are designed to get you up and running with a standard Alfresco implementation in days. Although these packages have limited options, they do include business analysis, project management, some level of customization, basic dashboards, data import and training. Business analysis and implementation are only half the battle. The onboarding phase is just as important, if not more, and that is why we train and support you in order to reach your adoption targets. New tools and systems only work if people use and enjoy them. Illustrate where you stand today, from 0-100%. Show you how you are doing in your department (whether you work in sales, customer service, accounting, HR, document management or marketing). Help you identify areas where you can make productivity gains.